I have been enlightened by reading this wiki, Baconic Brothers and Sisters. Thou shalt not consider Bacon on the same level as any other food, as it is above all. Thou shalt not consume imitation Bacon. 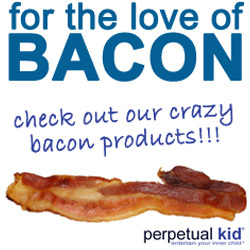 Thou shalt not stop pursuing Baconlightenment until it is reached. Thou shalt not forget to consume Bacon for ten days. Also I have been able to read up on the National Bacon Party and Bacon in Science. Particularly intruiging is the Big Bacon theory vs. Bacogenesis. The Holy Church of Bacon needs your help to spread this delicious religion. Go to the Community Portal to see how you can get involved. Anonymous, that's the image file I have up already.